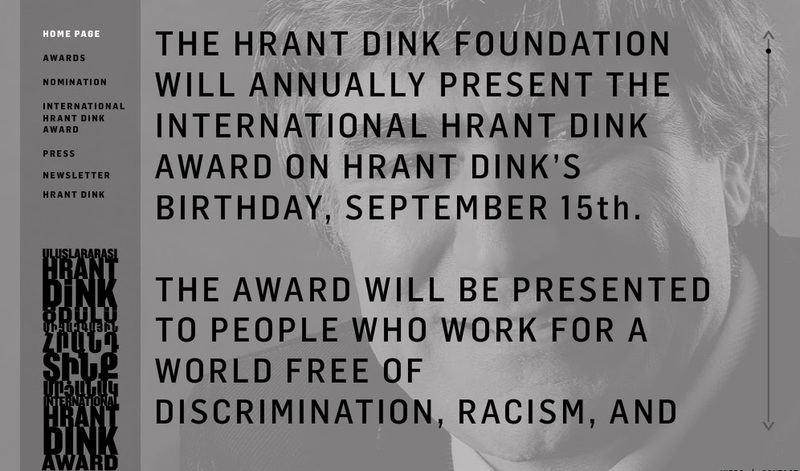 On Hrant Dink’s birthday - 15 September, the Hrant Dink Foundation presents annual International Hrant Dink Award. The Award is "presented to people who work for a world free of discrimination, racism and violence, take personal risks for their ideals, use the language of peace and by doing so, inspire and encourage others. With this award, the Foundation aims to remind to all those who struggle for these ideals that their voices are heard, their works are visible and that they are not alone, and also to encourage everyone to fight for their ideals." 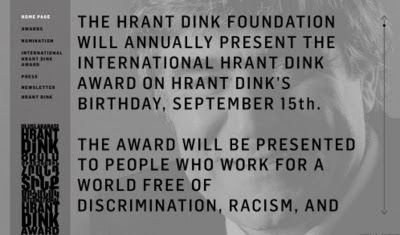 Since 2010, in addition to the grated awards, the International Hrant Dink Award ceremony salutes “Inspirations” - “those people, organizations, initiatives and projects that we support wholeheartedly, those that make us happy for sharing the same world and walking the same path”. This year PINK Armenia was named among “Inspirations”. PINK Armenia is truly an inspiration for many of us. One of the very few groups in Armenia keeping THE hope alive that one day Armenia will turn into a country closer to my dreams. Big congrats, PINKies !! Well deserved. List of “Inspirations” is pretty awesome this year, including groundbreaking group of Families of LGBT from Istanbul. Before the awards presentation, Inspirations, a group of people and institutions from Turkey and from all corners of the world who multiply hope for the future with the steps they take, were saluted with a film acknowledging their achievements. The Inspirations of 2012 included the resistance of villagers of Bil’in, a Palestinian village in the West Bank; the Romedia Foundation in Hungary who work for the rights of the Romani people in Romania; HOPE NOT HATE, an initiative from the UK that fights racism; PINK Armenia, an organization that works for LGBT rights in Armenia; Masa Mirkovic, director of ‘New Generation’ in Bosnia Herzegovina, an organization that supports children who are victims of violence; Triveni Acharya, an activist and journalist from Mumbai who works to prevent human trafficking; Mark Kabban, a Lebanese American immigrant, who works towards the social integration of immigrant children; Dr. Benjamin LaBrot from the United States who develops healthcare projects for remote parts of the world; James Kityo from Uganda, who develops innovative public health and shelter projects; the Initiative for Solidarity with Arrested Students in Turkey; the ‘My Body, My Decision’ campaign of Bianet, a media organization from Turkey; the solidarity organization Families of LGBT from Istanbul; the ‘Van, You Are Not Alone’ Campaign, organized in the aftermath of the Van earthquake; and The Mad Waves Outside initiative from Turkey that sends books and stationery to political prisoners.